Polanisia jamesii (James' polanisia) occurs in a limited portion of the central Great Plains and its presence in Minnesota is part of a small additional range near the Mississippi River blufflands from Illinois to Minnesota. It is listed as endangered in Iowa, threatened in Illinois, and special concern in Wisconsin. These northern populations appear to be restricted to sandy or sandy-gravelly deposits associated with eroding slopes and exposed, coarse, fluvial deposits or sandy colluvium. Such habitats are limited in extent and occur near the Mississippi and Illinois River valleys, areas that face impacts from commercial, industrial, recreational, and residential development. Polanisia jamesii was first discovered in Minnesota in 1978 in a sand dune/coulee complex near Hastings in Dakota County. Recognizing the impending threat of rapid development in the area, searches for additional sites continued in the 1980s. Systematic biological surveys of all southeastern and east-central counties in Minnesota were conducted in the 1990s. Despite focused search efforts, new populations were found at only a few additional sites. All sites were concentrated within a small portion of adjacent Dakota and Washington counties. At the original collection site, most of the native sand prairie habitat is now degraded or destroyed by off-road vehicles, sand and gravel extraction, pine plantations, and residential development. At the other Dakota County sites, the encroachment of woody plants or more aggressive plants shade out this tiny species. Also, most of the Dakota County sites are on private land. The two Washington County sites are in protected areas, but these populations are small and the suitable habitat is very limited compared to some of the Dakota County locations. 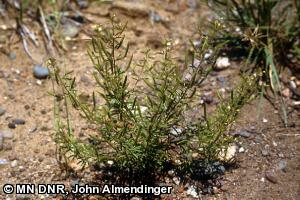 Polanisia jamesii was listed as an endangered species in Minnesota in 1984. Polanisia jamesii is a small annual plant that grows in full sun. It can reach maturity even if it is scarcely 8 cm (3 in.) tall. Under better conditions, a plant may branch out and reach 20 cm (8 in.) or more in height. Reliable features for identification are the leaves, flowers, and fruit. Leaves have 3 narrow leaflets that are less than 4 mm (0.16 in.) wide. The small whitish flowers have fringed petals that are unequal in length, the longest being no more than 5 mm (0.2 in.) long. The fruit capsule is no more than 4 mm (0.16 in.) wide. These features will distinguish it from the larger common species, P. dodecandra (clammy weed), which often grows at the same site. Leaflets of P. dodecandra are more or less ovate in outline rather than having linear sides, and fruits are wider. Its petals fall off quickly but, if present, they are not fringed. These species of Polanisia superficially resemble plants in the mustard family by producing a capsule. However, mustards have a central partition inside the pod, half of the seeds on each side. Polanisia capsules have no partition inside (Iltis 1958). In Minnesota, P. jamesii occurs on sandy or sandy-gravelly soil in dry open settings with sand prairie species. This includes southern dry prairie (dry barrens prairie and dry sand-gravel prairie types) and southern dry savanna (dry sand-gravel oak savanna type) native plant communities. The sites are all on post-glacial stream deposits, especially where glacial meltwater streams cut into fluvial deposits creating coulees or small valleys. The dry valley walls, sandy aprons of colluvium at the base of valley walls, and local dune-like deposits or blowout of sand are all places in which P. jamesii might occur. This species prefers full sunlight, but woody plants and more aggressive plants are now encroaching on many habitat patches. In areas of steeper terrain, it typically occurs on slopes with south- or west-facing exposures. Plants that commonly occur in association with P. jamesii are Calamovilfa longifolia var. longifolia (sand reed grass), Dalea villosa (silky prairie clover), and Liatris punctata var. punctata (dotted blazing star). Polanisia jamesii is an annual plant and therefore must start growth each year from seed. It is not known how long the seeds remain viable in the soil in these northern locations. Because the species grows in a fairly harsh dry environment, it is likely to have seeds that remain dormant for a considerable number of years. Plants face a high risk of seed crop failure during years of major drought. They also risk being dislodged and killed by normal natural erosion on the unstable slopes and sandy places where they occur. A portion of the Dakota County P. jamesii populations are now protected in the Hastings Sand Coulee Scientific and Natural Area, but there is a need to provide additional protected habitat. It may be necessary for this species' survival to ensure that at least some plants at each site reach maturity and produce seeds in most years. An immediate threat is encroachment by woody plants or taller more aggressive plants that can either shade or crowd out this small species. Wildfires and the action of wind probably kept its sand prairie habitat more open in the past. Residential development limits the possibility of using fire, but hand removal of brush is still a viable management activity that could help spare this plant from further decline. The best time to search for P. jamesii is mid-June through August when it is identifiable by leaves, flowers and fruits. Plants can die and shrivel quickly if late summer is droughty. In good years, identification by fruits is possible in September. Systematic inventory by the Minnesota DNR County Biological Survey has been quite thorough for P. jamesii in Minnesota. This is a major contribution to conservation because it gives land managers and planners a sound basis for establishing protection priorities. The presence of several rare plant species, including P. jamesii, was a driving factor behind the acquisition of the Hastings Sand Coulee Scientific and Natural Area in Dakota County. Iltis, H. H. 1958. Studies in the Capparidaceae-IV. Polanisia Raf. Brittonia 10:33-58.